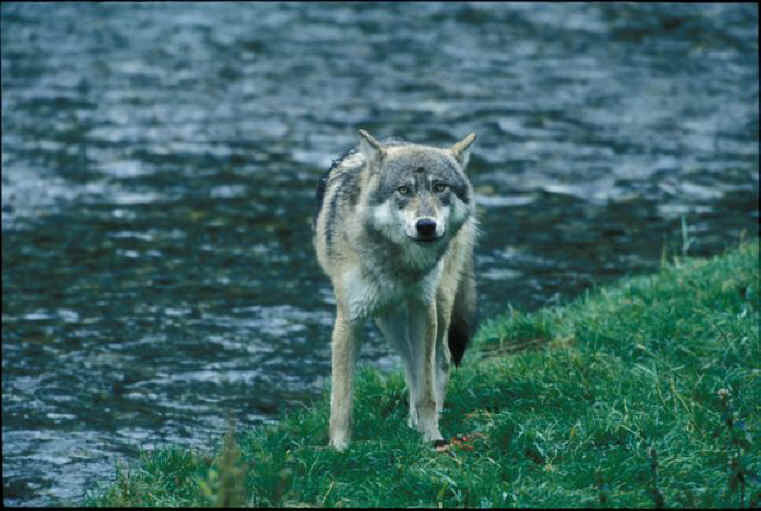 The Obama administration has lifted protections for gray wolves in a handful of Western states. Soon, it could be hunting season on them once again. Before she was found slain 120 miles west of Denver in late March 2009, wolf 341F charted an extraordinary course, tracked only by satellite, through the heart of Western ranch country, where her kind are still regarded as lupus non grata. A young female lobo-a "disperser" born into a wild pack inhabiting Montana's Absaroka Mountains just north of Yellowstone National Park-she completed a solo odyssey covering 1,000 miles. Only after crossing Wyoming, Idaho, and Utah did 341F's life meet a sudden tragic end near the ski resort town of Vail, Colorado. Researchers discovered her body after the GPS collar around her neck emitted signals indicating she was no longer on the move-and authorities say she did not die of natural causes. A criminal investigation is ongoing and, so far, no human suspect has been apprehended. These days, Mike Jimenez can relate to 341F's perilous journey. The veteran wolf biologist with the US Fish and Wildlife Service runs his own gauntlet between haters of wolves and conservationists now challenging the federal government's latest action. Fifteen years after gray wolves were successfully reintroduced to Yellowstone and a separate expanse of wilderness in central Idaho, Interior Secretary Ken Salazar on Monday implemented a decision made previously by the Bush administration to formally remove these wolves from the federal list of endangered species in Montana and Idaho. A coalition of environmental groups led by the green law firm Earthjustice says it intends to seek an injunction in US district court to reverse the delisting decision. They argue it is both premature and grants states, including Idaho and others, a license to start killing large numbers of wolves using hunters and, potentially, aerial sharpshooters. A year ago, when wolves were briefly delisted until environmentalists overturned that decision in court, more than 100 were shot regionwide in a matter of weeks. Some were run down and trampled by snowmobilers in Wyoming who won praise as local folk heroes. Few wildlife advocates dispute Salazar's assertion that, with more than 1,645 wolves in the northern Rockies today, their restoration rate is one of the greatest conservation achievements in US history. Except for a few packs that wandered back and forth along the Canadian border, gray wolves were wiped out in the West by the middle of the 20th century. The original goal of a restoration plan written by the Fish and Wildlife Service in 1994 was to have 100 to 150 wolves in each state. Today, there are an estimated 500 wolves in Montana, 850 in Idaho, and 300 in Wyoming. Environmentalists maintain that biological recovery will be complete once the population reaches between 2,000 and 5,000, while ranchers and some state officials insist the current number is already way too high. In Idaho, Republican governor Butch Otter has endorsed a proposal to halve the state's wolf population of 88 packs and more than 1,000 individuals (counting new pups born this spring). Otter has said he plans to apply for a wolf-hunting permit so he can be the first Idahoan to fell a wolf. The governor claims that wolves have taken a huge toll on big game animals, namely elk-even though his own fish and game agency noted recently that elk numbers in Idaho are actually meeting or surpassing population objectives in most areas. Ironically, just over the state line in Wyoming, wolves will remain protected under the Endangered Species Act even if they are delisted elsewhere-largely because the state has been even clearer than Idaho in announcing its intention to kill them. The management plan Wyoming submitted to the Fish and Wildlife Service in 2007 classified gray wolves as vermin to be shot on sight, at any time, over roughly 85 percent of the Cowboy State; a court threw it out the following year. Wyoming's Democratic governor, Dave Freudenthal, says he intends to sue the federal government to gain control of wolf management, and some ranchers have also threatened to take matters into their own hands. With attitudes on both sides hardening, Jimenez may be one of the few people aiming for a middle ground. From his perch at the Fish and Wildlife office in Lander, Wyoming, Jimenez says it's clear that while environmentalists' fears of a potential Old West-style wolf slaughter are likely overblown, claims of the predators wreaking massive havoc on livestock and wildlife herds are grossly exaggerated. "For some of my conservation friends, it's hard to appreciate how the other side is impacted by wolves," Jimenez says. "The challenge is that there is a disproportionate cost-benefit aspect of having wolves back. One side, often a more urban population, disproportionately gets the benefits of wolves at the expense of people coexisting with them on a daily basis in rural areas." Across Idaho, Montana, and Wyoming in 2008, biologists documented that wolves killed 214 cattle, 355 sheep, 28 goats, 21 llamas, 10 horses, and 14 dogs; for perspective, more than 1,200 beef calves and lambs were killed by a prairie blizzard along the Montana-Wyoming state line this past April. To investigate those killings (and destroy 246 offending wolves), federal and state agencies spent a total of $1 million. Livestock owners were paid $500,000 in restitution. "It's easy to want wolves when they don't live in your backyard," concludes Jimenez. "And it's also easy for some in the livestock community to deny the biological significance of wolves and what their survival means to millions of Americans. This respect for both perspectives is what is missing from the current discussion." Renowned wolf expert L. David Mech, who has studied the animals since the late 1950s and who helped draft the blueprint for returning wolves to the West, strikes a similar chord. Reached at his office in Minnesota, where he has helped lead wolf recovery in that state, Mech said wolf populations can sustain annual losses of 35 percent without falling into decline. However, he warns that if Western states attempt to purge wolves using aircraft, excessive shooting, and trapping, they will likely face a massive public backlash and a possible return to federal control. Noting that it's "a miracle" to have thriving wolf numbers in the northern Rockies at all given how close they were to extinction, Mech says the animals' survival should be vigorously defended in some areas, such as Yellowstone and the central Idaho wilderness; by contrast, environmentalists should expect public tolerance for wolves to be low in traditional ranching areas. It's the same in his home state of Minnesota, whose wolf population of 3,000-the largest in the Lower 48-was also removed (along with Wisconsin's and Michigan's) from federal protection on Monday. Timber wolves are now vigorously protected in the state's north woods-though there's talk of a sport season on the animals-but they risk being killed when they venture into farm country. Ultimately, Mech says, those in the pro-wolf camp may have to accept that states will eradicate wolves wandering beyond the core recovery area. But until the gray wolf population has fully recovered in the Rockies, says Earthjustice attorney Jenny Harbine, the Obama administration-rather than staying on the course set by the Bush administration-should keep Canis lupus protected. "We're really close to having a sustainable wolf population and achieving recovery the way the Endangered Species Act was intended," she says. "We don't want to see this golden opportunity squandered away."